No matter where you look on Capitol Hill, numbers and letters abound. Passing three schools and multiple playgrounds on my way to work made me consider the variety of letters and numbers that appear on buildings or in art work on Capitol Hill. Considering the Capitol campus by the numbers (and letters) is an interesting exercise. All of the congressional office buildings feature cornerstones carved with the dates of when they were laid. The Capitol Pediments have dates and letters too. For example, the sculptural pediment over the east central entrance of the U.S. Capitol Building is called Genius of America (cover photo). The central figure represents America, who rests her right arm on a shield inscribed "USA"; the shield is supported by an altar bearing the inscription "July 4, 1776." America points to Justice, who lifts scales in her left hand and in her right hand holds a scroll inscribed "Constitution, 17 September 1787." 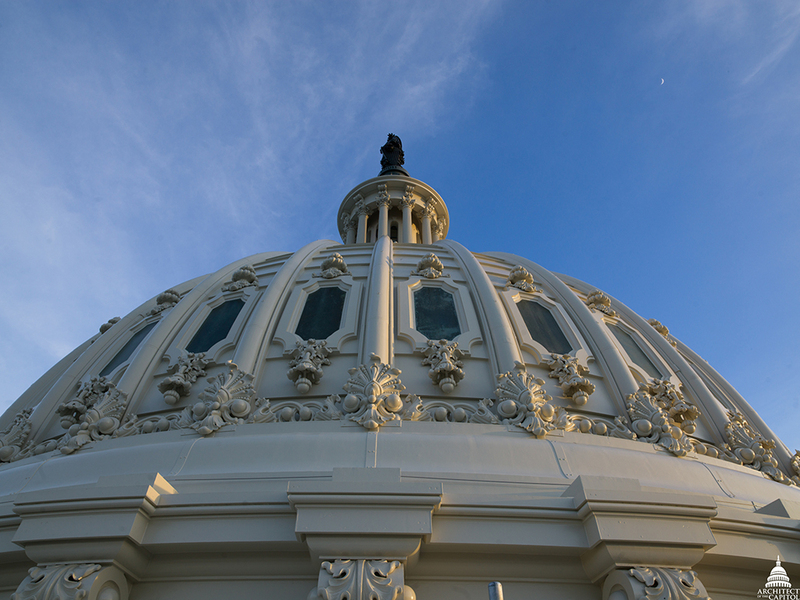 Pieces on the Capitol Dome have unique identifiers, including letters and numbers. Similar to a paint-by-the numbers kit, the system is used to ensure the cast-iron pieces are correctly installed. Many of the bolts are also stamped with the letters, M.C. MEIGS in reference to the engineer, Montgomery Cunningham Meigs, who worked on the Capitol extension and the Dome. Cupola windows on the Capitol Dome. A broken Cupola window is replaced in 1959 (left) and interior window labels inform visitors of the age of the windows (right) located near the stairwell leading to Tholos. The Cupola windows look identical from the outside, but feature unique details that tell a special story when viewed from the interior. 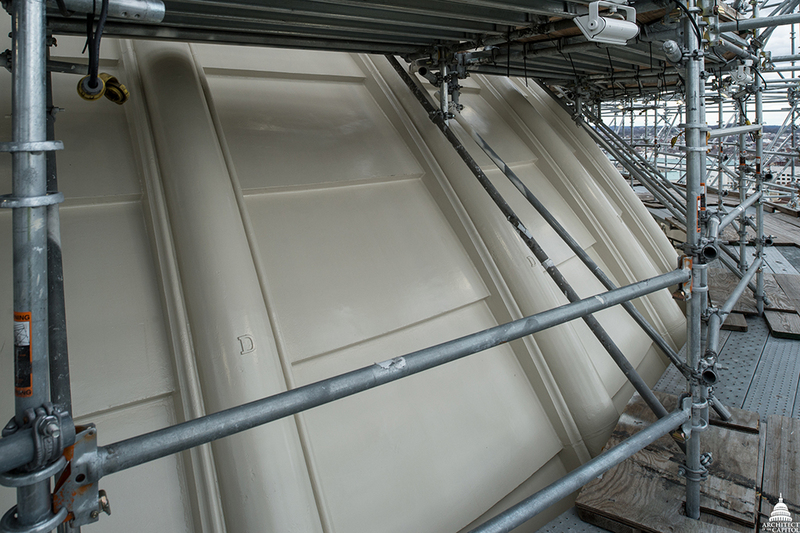 The Dome has not undergone a complete restoration since 1959. Windows in the Cupola were originally installed in the 1860s. Some of those windows were replaced in 1959 and a few more were replaced in 2016. 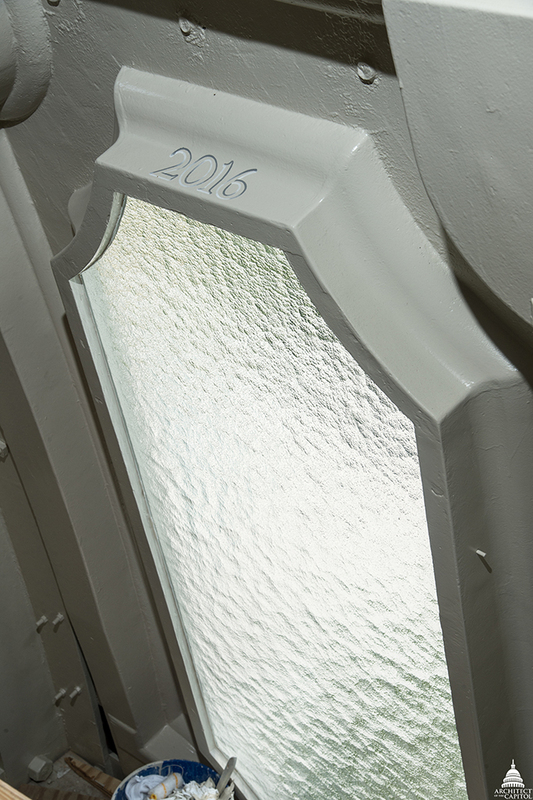 The replacement glass in 2016 was created using a traditional process, similar to what was used to generate the original 1860s windows. This method recreates the wavy "metal chilled" surface texture of the current windows while updating them to today's standards. The windows are labeled with the installation dates from each time period near the stairs leading to Tholos. 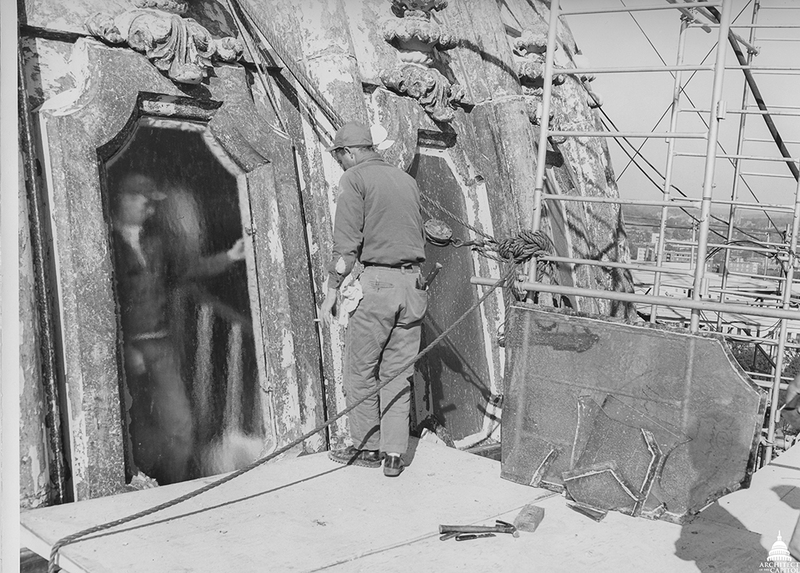 Ports' name was found etched into a cast iron coffer during the current Capitol Dome Restoration Project (left). 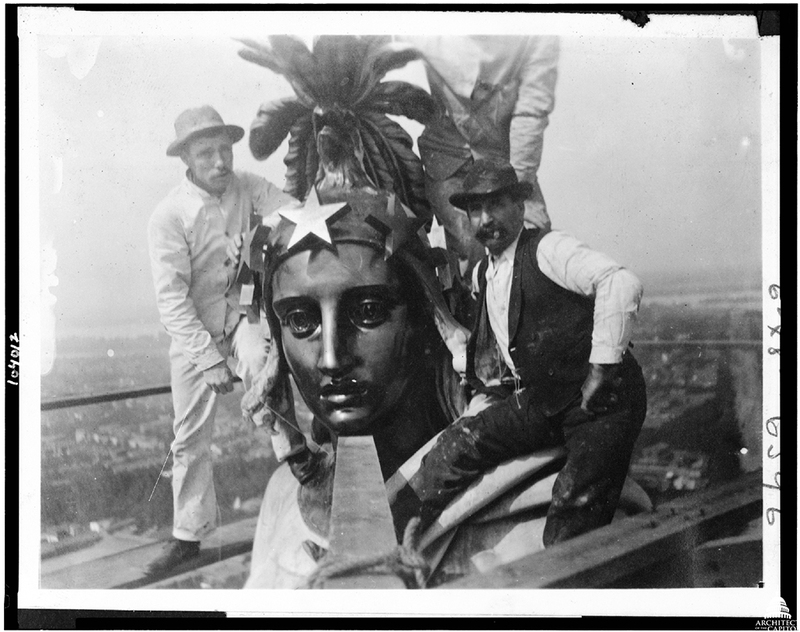 Ports, seen in the right photo with a cigar, stands next to the statue Freedom on the top of the Capitol Dome. One surprising find during the Dome restoration surfaced beneath one of the cast-iron coffers in the Rotunda. 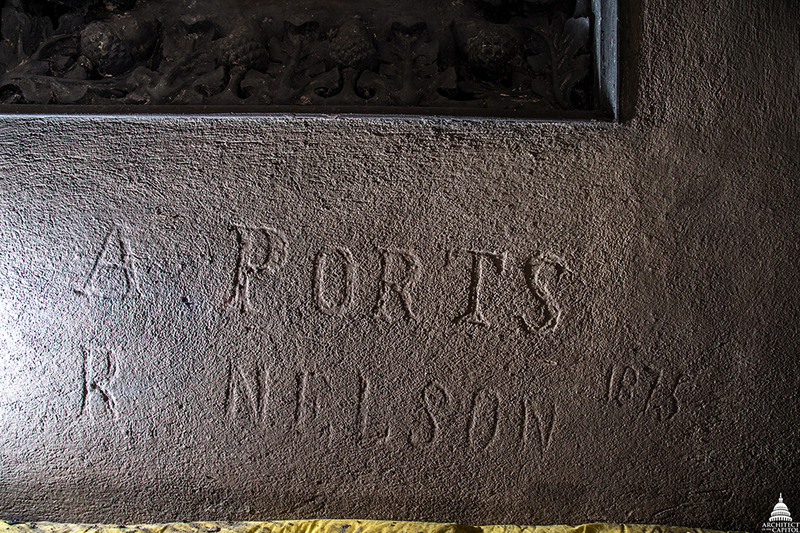 The name Al Ports, with the date, 1875 was etched into the plaster near column line 6, beneath the Frieze painting depicting Pizarro going to Peru. Ports worked on several Capitol Building projects for the Architect of the Capitol until at least 1910 as a laborer, painter and eventually a rigger doing annual repairs. 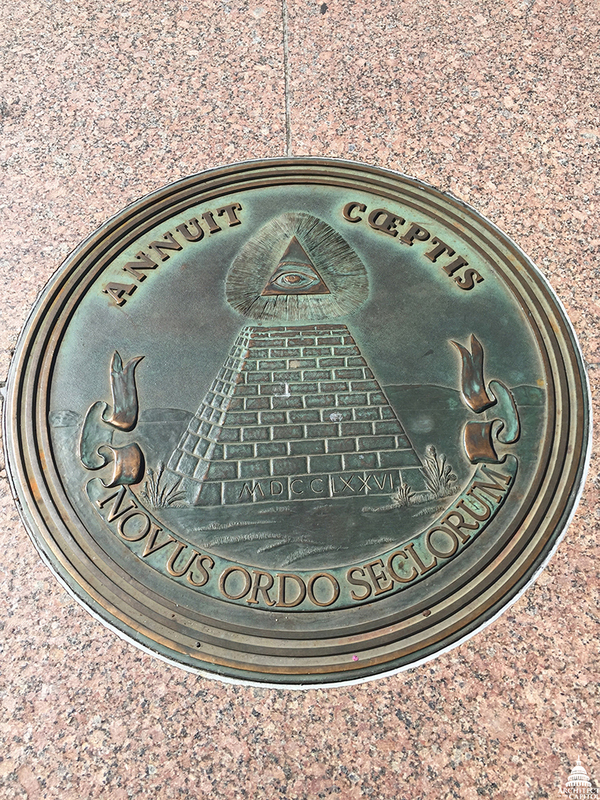 Great Seal of the United States in the Thomas Jefferson Building, and the reverse side of the seal includes an unfinished pyramid with the Roman numerals for 1776 at its base, as seen on a plaque in Freedom Plaza. To the east of the Capitol Dome you can find the Library of Congress buildings. Resplendent with interesting details, stop and look at an explosion of art and architectural elements that incorporate letters and numbers. 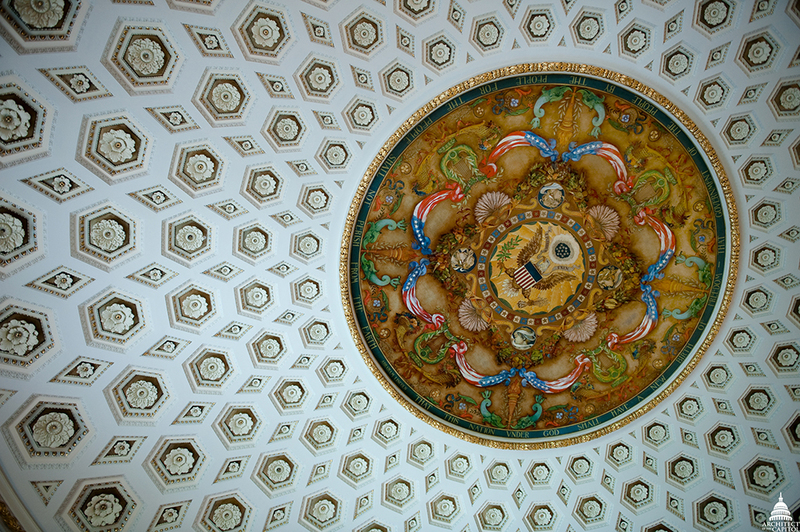 The details in the Adams, Madison and, most impressively, the Jefferson Building will leave you breathless. Throughout September, look for additional posts to the Architect of the Capitol's social media feeds on the numbers and letters you can see on the Capitol Campus. When did the Congress first meet in the Capitol Building?